LTD2012 Michi, Acoustic-electric Folk/Western guitar from Takamine in the Limited Edition series. Takamine Guitars introduces two new offerings, the LTD2012 and LTD2012C guitars. 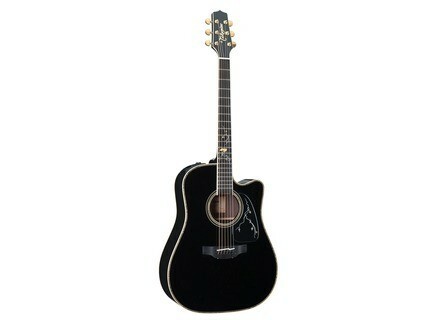 The 2012 Limited Edition Series mark Takamine's 50th anniversary. Guided by the theme of "Michi," the Japanese concept of a path or a course to follow over a distance, the 2012 Limited Edition Series commemorates the course of Takamine's 50-year history. Each guitar features a growing vine motif that is symbolizes Takamine's life. The LTD2012 is a dreadnought guitar with a Spruce top and solid Rosewood back, with the addition of a Takamine Cool Tube preamp system. The LTD2012 C is a special addition to the series, and is the first nylon string limited edition model in Takamine's 50-year history. The growing vine motif decorates the body of the guitar, and soundhole. With a Spruce top, solid Indian Rosewood back, and classic oval soundhole, the LTD2012 C incorporaes a CTP-2 Takamine Cool Tube preamp system. [NAMM] Z.vex Loop Gate Z.Vex Effects announces three new effects at Winter NAMM 2012, including the Loop Gate. [NAMM] Takamine T50th In celebration Takamine's 50th anniversary, the company introduces the limited edition T50th guitar. [NAMM] Z.vex Double Rock Z.vex Effects announces production prototypes for three new effects at Winter NAMM 2012, including the Double Rock.